Item Number: 84-10-10L 19258 Actual Weight: 1 lb. Secure bins, drums, containers, meters, pharmaceuticals and more. 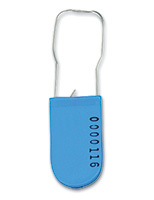 For added protection, plastic padlock seal features wire hasp that must be cut to be removed. Consecutive numbering on each padlock seal increases organization and recordkeeping.